Big Savings from Going Ductless!! The above chart is a comparison of the Kilowatts per hour used by an Alpine Ductless client from January 2011 to December of 2012. Over the course of the two years, no changes were made to the occupants of the house and/or to the house itself, with the exception of the Ductless Heat Pump, which was installed on March 12, 2012, and a new refrigerator, which was installed in August of 2012. The home was built in 1960, has a daylight basement with a cement floor with no insulation underneath. The home received a significant remodel in 1998 with new doors, vinyl double pane windows with low E coating, R-19 insulation in all exterior walls and R-30 insulation under the roof. Prior to the installation of the Ductless Heat Pump, the heat source was an electric forced air furnace. All ductwork for the furnace was contained within the building’s heated space, so no heat was lost to a crawl space or attic (which is often the case in homes with ducted systems). During the months of January and February there was very little change in total Kilowatts used as the homeowners were still using the forced air furnace system to heat their home. 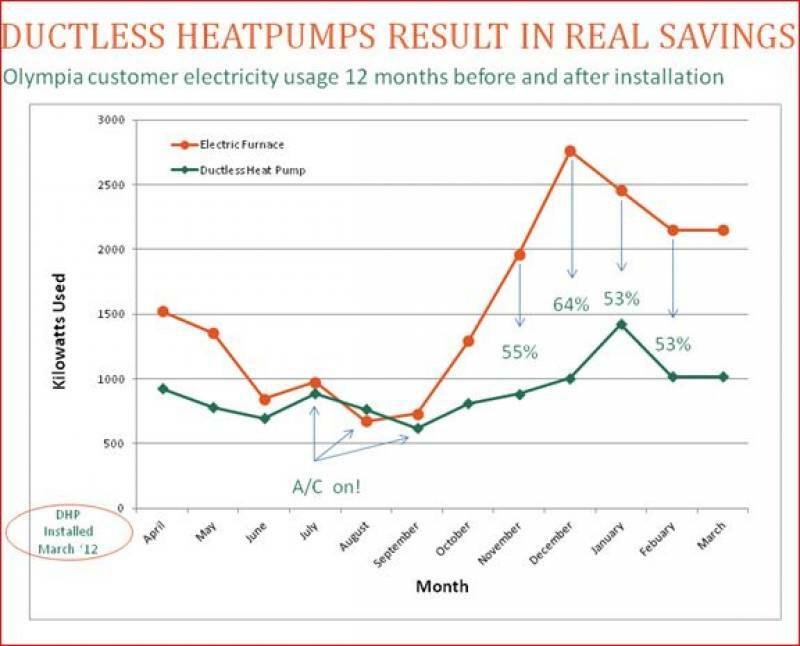 March saw the first drop in usage, after the Ductless Heat Pump was installed, but for eleven of those days the homeowners were still using the old system. As summer approached and less heat was required to keep the house comfortable, the difference in kilowatt hours between the two years was less, but still significant. In August they actually used 68 more Kilowatts due to the Ductless Heat Pump operating in air conditioning mode, an option they never had before with their forced air furnace. October was similar to the spring months of April and May, but with the outside temperatures dropping in November and December, major savings occurred. Part of December’s huge savings was a one week vacation over Christmas during which time the homeowners turned the ductless heat pump down to 60 degrees Fahrenheit. Based on this data the homeowners experienced an annual savings on their power bill of 44%, which in their case is approximately $900.00 dollars! Our clients now have a more comfortable home in both the winter and summer months and are saving a significant amount of money on their heating bills. They feel the Ductless Heat Pump was one of the smartest investments they have made in their home, and so do we. If you are interested in realizing this kind of savings in your home or office, contact us to schedule your free, in-home estimate today.